This is "programming" at its most fundamental. 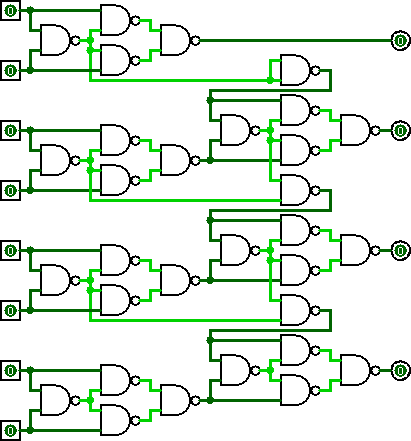 Build a diagram of (two-wire) NAND logic gates that will take the input wires A1, A2, A4, A8, B1, B2, B4, B8, representing two binary numbers A to B from 0 to 15, and return values on the output wires C1, C2, C4, and C8 representing C, which is the sum of A and B modulo 16. 03-07 19:09: Due to discussions with Jan Dvorak, it came to my attention that the total number of gates, constants and splits is always determined solely by the number of gates. Because of this, I have simplified the score requirement back down to simply the number of gates required. These combined yield a naive 36-gate four-bit adder. Not bad. for a grand total of 31 gates. Note that the count of splits and NAND-gates are intimately connected: Each 2-input NAND (larger are explicitly forbidden) takes two inputs and produces one output. Each 2-way split (let's assume larger splits are forbidden) takes one input and produces two outputs. Also, there are no unused outputs or floating inputs (let's assume constants are not allowed). If there are N more inputs than outputs, there must be N more NANDs than splits. Thus, a 31-NAND 8=>4 module will neccessarily have 27 2-way splits.